dianab and 5 Guests are viewing this topic. is it true that meaghan announced it at Eugenies wedding? there's a lot of DM comments saying she did that. I heard on the TV news she just told the Queen she did not make any big announcement at the reception. She is not showing that much this early so the oversized coats are a fashion blooper not a necessity. The good thing about this child is he/she they have a dad that genuinely likes kids so no matter if Murks is a narc, he will compensate. The Queen, Duke of Edinburgh, Prince of Wales, Duchess of Cornwall and Duke & Duchess of Cambridge “are delighted for the couple” and were able to congratulate the Sussexes in person at Princess Eugenie’s wedding. For those asking, Duchess Meghan did receive medical advice before deciding to continue with travel to Fiji and Tonga. It’s worth noting that she will not be at the early morning Fiji War Memorial engagement in Suva or the Colo-i-Suva forest site that Harry is doing solo. ^^Maybe it’s a shock to his system that he has to be a responsible adult now? Children aren’t just to play with. Very good point Yooper. The dream and the reality can be quite different! MM moved here last November, so they haven't lived together for a year yet. In the interim was the wedding and MM starting on public engagements (such as they are). Things have happened very (too) quickly in this relationship, imo. I realize that she's older and they both probably want to start a family as soon as they can but, to me, this is just too fast. Maybe a doctor advised them to start early. She probably had some physical exams to see about her fertility. It might be like the Clooneys where they have twins. Heartless indeed. It’s infant baby loss day. Pictures of Harry looking miserable. Either he’s playing a game to to get rid of her as she’s been nothing but a liar and a cheat or he was dumb enough to somehow be blinded by this fake and did knock her up. How can the tour go on or them attending IG. Everything’s overshadowed by this. The press needs to ask questions because they have them attending a booze filled 3 day party in Soho House Amsterdam. Surely if she’s pregnant now she was pregnant then. One’s obviously lying. My bet’s on Meghan. ^^If she has popped so fast from the Sussex visit on Oct 3rd and needed to announce 13 days later then I'm guessing twins. ^I was shocked that my local ABC news didn't announce and I was watching from 5:30-6:45am while getting dressed to go to work. If they went months with no pregnancy there would be probably even more comments made. Supposedly Meghan did not drink alcohol. Didn't they skip the parties? Or so I thought. I have to admit, telling people at Eugenie's wedding was her trying to ump one up. She had plenty of days ahead to tell them and the announcement could have come after. The news made it sound only the Queen was told. If there is an interview sometime, maybe more specifics will be given. Or of course People Magazine will probably give some details. I doubt there will be a gender reveal party royals don't do that sort of thing. If these two want to keep bucking royal protocol, then they should be removed from the royal family. Harry’s looking like the fool as he’s the actual royal who knows full well how things are done and this isn’t. Celebrities do this kind of thing where they have no regard for other people. She’s supposed to be a humanitarian and fighter for woman’s rights yet she chooses today of all days to announce this. They’re too disruptive and unbelievable to continue on as now they’ve put the focus on them. Every event and interview with the vets will be about them expecting. I feel bad for the vets who again won’t get proper coverage due to Meghan again. She's not pregnant. This is all a farce by Megs and her cohorts. She's at least 37 years old -- if not older -- she's been an avid admirer of chemical substances, and she just took a plane ride halfway around the world to a place where a dangerous virus lurks. She's not fertile and if she managed to get pregnant, then she should not be engaging in risky behavior. This is all about PR for Meggies. Pass the popcorn. Pictures of Harry looking glum on the steps and him walking holding hands with the fraudster. Isn’t it odd that this was announced whilst they’re both in another country? The other day there was a very odd article about if Meghan and Waity can get arrested. They can as long as the arrest happens no where near a castle or palace. 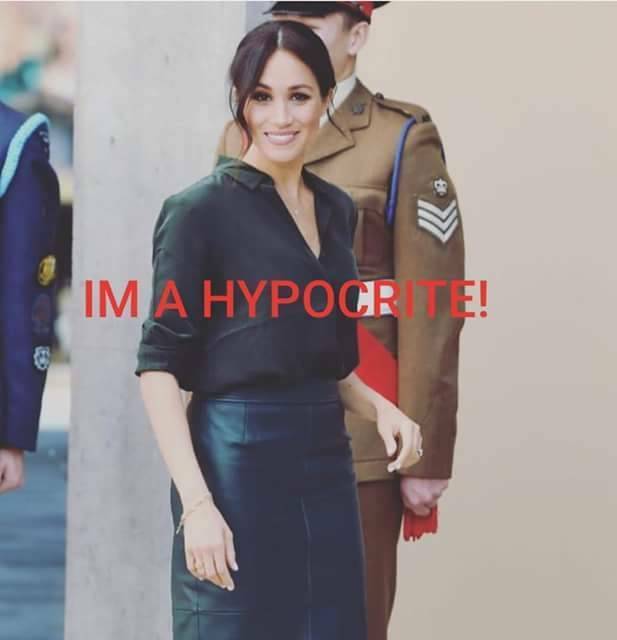 Australia’s perfect then because she’s been using the royal family for money, lied about being a victim of racism and having her place broken into, etc. He doesn't look glum just talking seriously in that photo. Not that the papers know but it doesn't look like the kid will be prince or princess unless the queen steps in. They are already talking that now. I suppose it will just be the direct monarchs kids that have the title while the monarchy lasts. Test should be in order when she gets back then as it’ll a high risk pregnancy. Funny though that with in the last 12 weeks she’s been said to have had a 3 day bender in Amsterdam and had a ball thrown at her during the youth coach awards, so she’s a very reckless woman who’s supposedly pregnant. No nowadays women in their 40s are having their first babies. Laura Linney the actress had her first child in her late forties.